If you are a creative person, you know how important is to provide your portfolio with an appropriate background. In the world of art every detail matters, that’s why building a professional website is a primary objective for everyone involved in photography, graphic and web design. If you have already chosen WordPress as your future website’s platform, there is some good news for you: the collection of portfolio themes for this CMS is really vast and diverse. The backdrop is that choosing the right template can take a lot of time, considering how many designs you should inspect and evaluate. We are going to help you with the choice by presenting a list of 20 best portfolio WordPress themes that will look up-to-date in 2016 and, possibly, later. 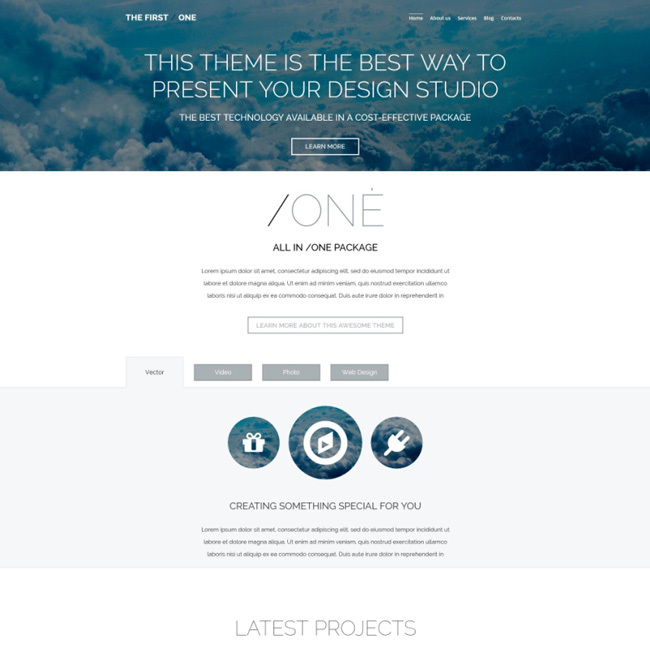 For this roundup we have collected free and premium themes to cater to any budget. If your choice is premium designs, have a look at this extensive inventory of 1750+ responsive WordPress themes. You will definitely find there exactly what you are looking for. In the meantime, let’s get started with our handpicked list. 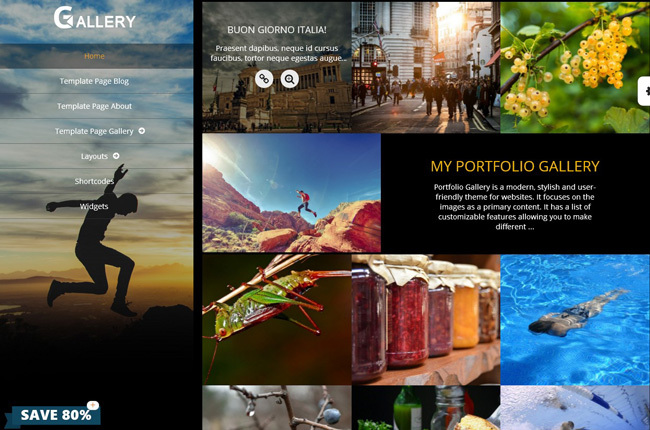 Portfolio Gallery is an elegant image and portfolio display theme. It is SEO-friendly and responsive. The theme helps to display images using various color schemes and layouts combined with elegant fonts and content parts. The theme is user-friendly in terms of back-end management. The default lightbox used in the theme allows displaying the images in full-screen slideshow. This WordPress portfolio theme with image portfolios, painting display, as well as beautiful scenery images. 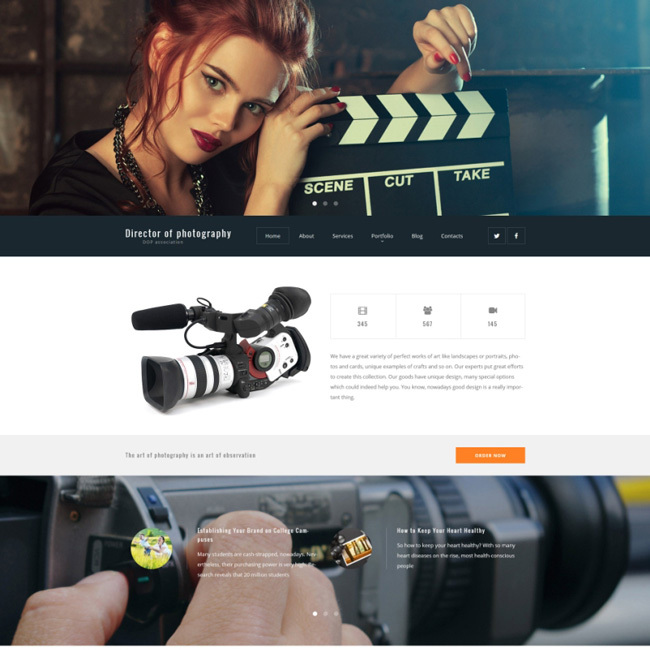 Houston is a classy portfolio WordPress theme for photographers, videographers, and creative agencies. It is featured by vintage-inspired colors and slender lines, which make it look elegant and professional. 4 gallery layouts will effectively showcase your portfolio. 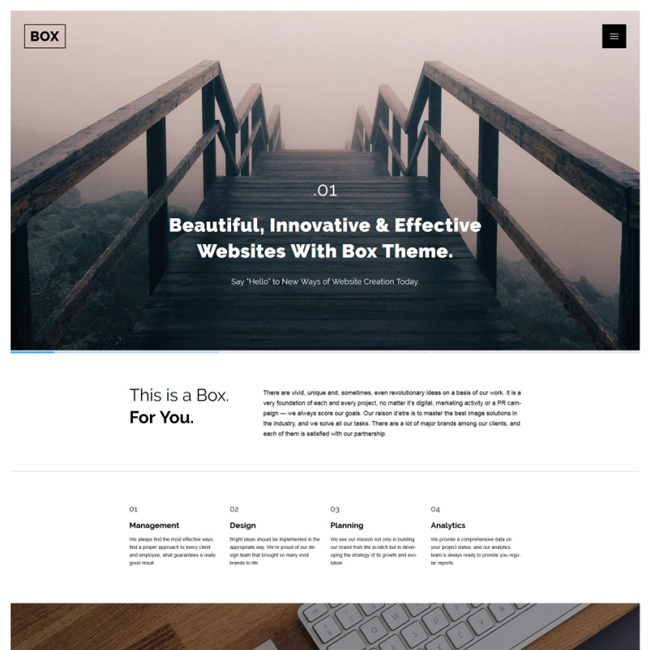 This theme offers such visual features as parallax effect, sliders, and hover animations. This design studio WordPress theme is a modern-looking and responsive way to build your creative portfolio in no time. It is built with Cherry Framework 4, which means you will be able to modify and manage it without having to write a single line of code. The homepage includes a content block with tabs displaying various gallery categories. 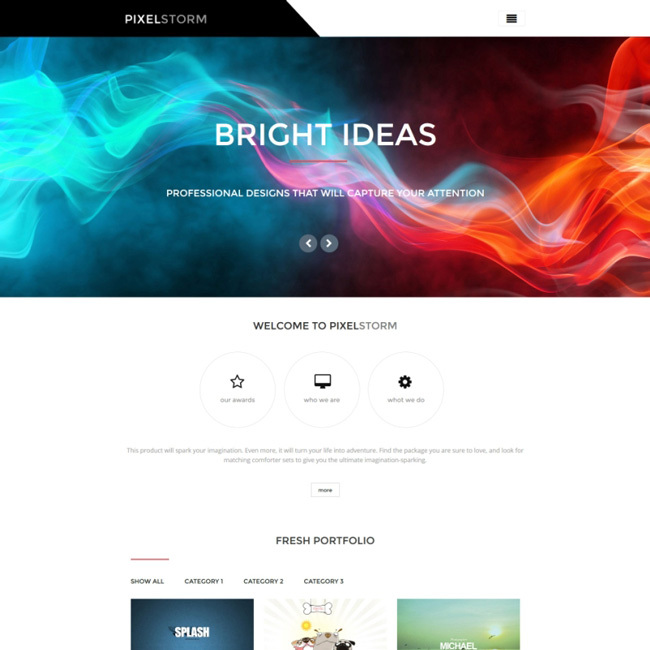 Pixel Storm is a modern responsive WordPress theme for digital artists. 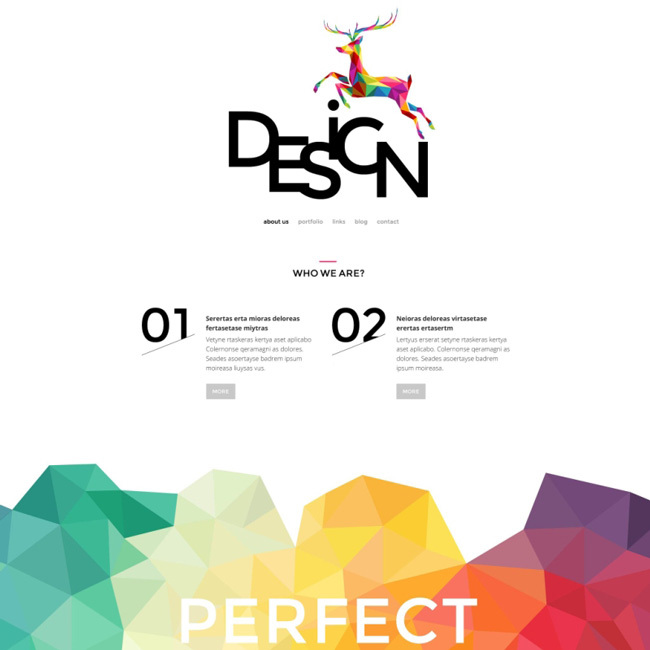 It design is based on colorful low-poly textures, inclined lines and clean white backgrounds. The navigation is powered by a sticky dropdown menu, where you can place the logo of your company. Available gallery layouts are: masonry, grid, justified and list. 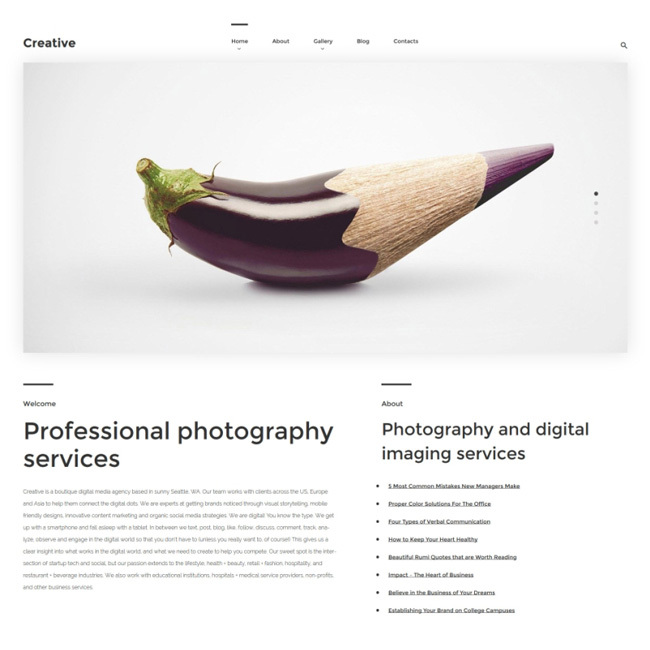 This photography portfolio WordPress theme is characterized by the heavy focus on parallax effect and large responsive images. It provides you with all kinds of tools to showcase and promote your photos: several gallery layouts, animated achievement counters, newsletter subscription blocks, and more. This theme comes with drag & drop MotoPress Content Editor, which will help you shape your posts and pages in a simple way. This top-notch photography WordPress theme has been optimized to deliver unmatched user experience. It is fully responsive and mobile friendly, has a landing page-like layout, and offers compatibility with WooCommerce, bbPress and BuddyPress. The contact page contains a feedback form and a custom Google Maps widget with the logo of your studio. 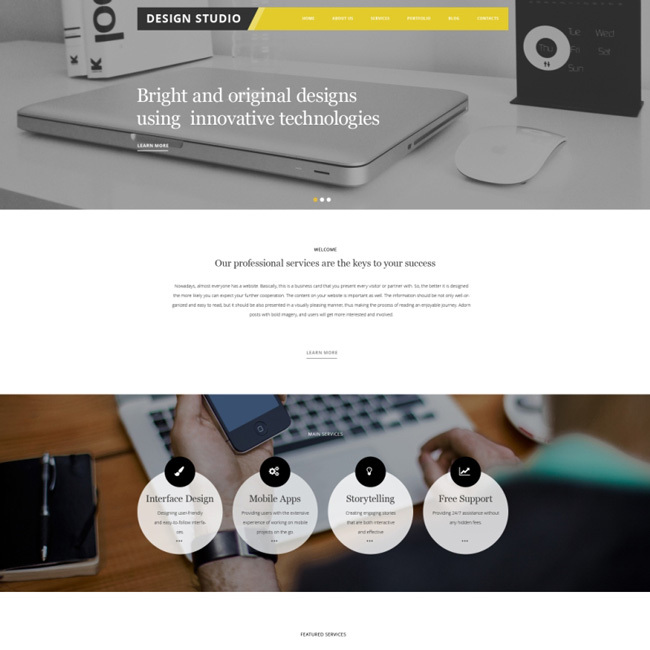 Design is a minimalist WordPress theme, which has been created to serve as a full-featured creative portfolio. It features catchy typography, bright colors, profound gallery options, and integrated videos. In the footer there is a Facebook Like Box added to help you promote your website via social networks. This theme can be easily customized, but it is ready to use out of the box. 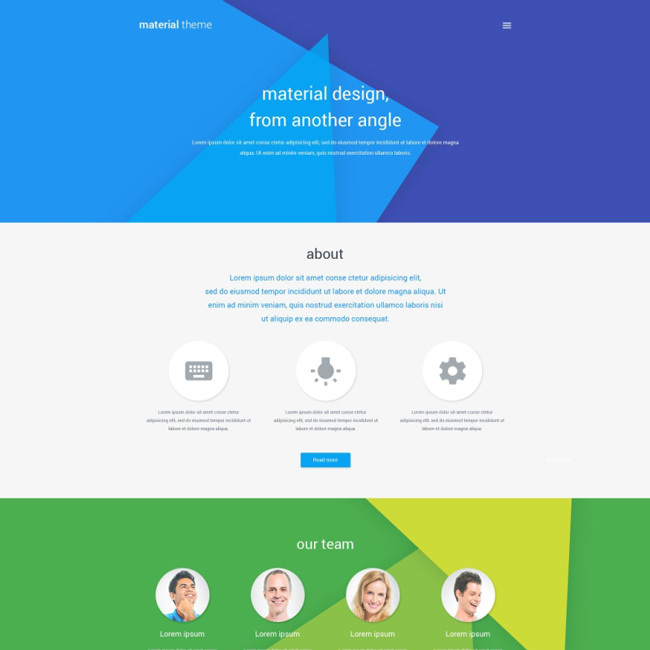 This responsive WordPress theme follows the latest web design trend – Google-inspired material design. It is quite multipurpose, and can be used to build a portfolio, a business website, or a blog. It is also fully customizable, allowing you to modify its typography, sidebar positions, color schemes; create sliders, and many more. Available are more than 80 shortcodes, and a number of custom post types. 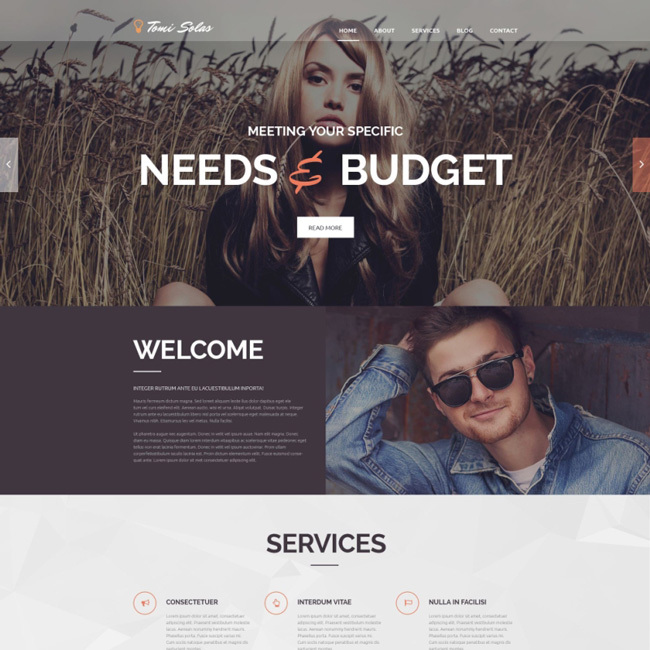 The First One is the cutting-edge WordPress theme for creative and marketing agencies. With its help you will be able to launch a business website in no time. This theme includes several predesigned single-purpose pages (Testimonials, Services, FAQ), custom widgets, and multiple color options. You cannot go wrong by choosing it for your next project. 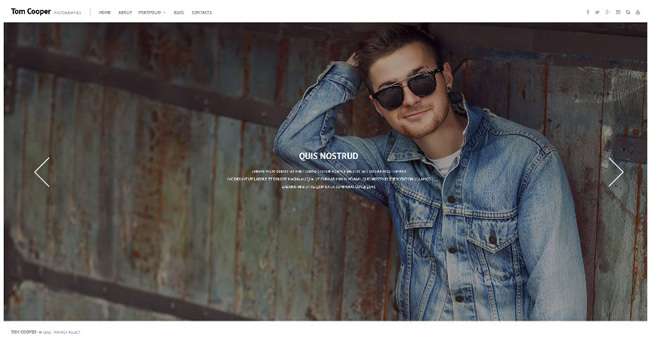 The design of this portfolio WordPress theme is based on the combination of flat blocks and photos, making it suitable for both photographers and digital artists. It features a boxed layout with clearly visible white borders, a full-size hamburger menu, and a minimalist sticky top bar with your company’s logo. You can choose from 3 gallery styles to showcase your works. 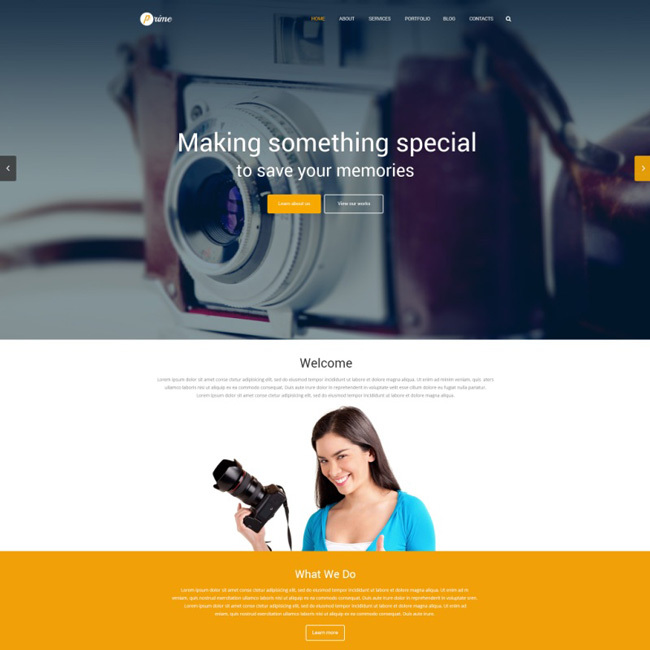 Tom Cooper is a full-page responsive WordPress theme perfect for photographers. Behind its simple layout there are a lot of functions aimed at creating a professional image of your portfolio. The main part of its design is the large slider on the homepage, which shows the best works from your portfolio. The theme is also equipped with a live chat plugin by Olark. 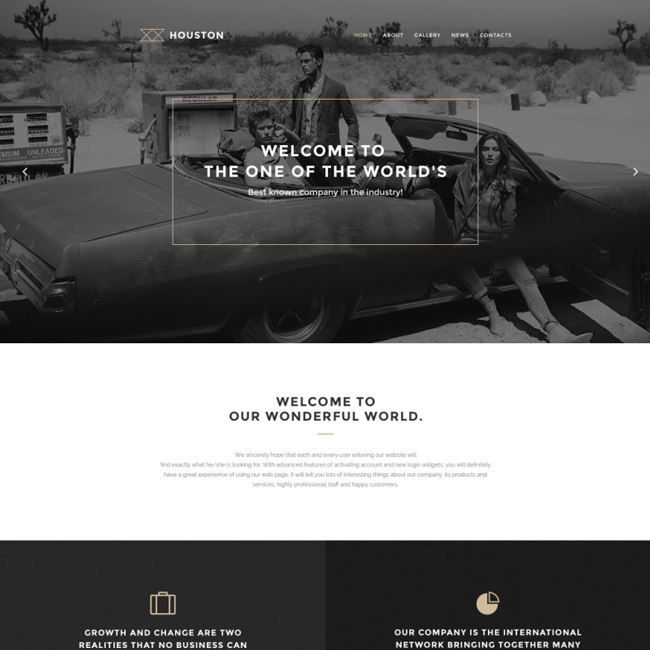 This beautiful portfolio WordPress theme is performed in warm tones, creating a vintage feel. Its large top slider is able to show not only images, but also videos, turning your visitors’ browsing experience into a real adventure into the world of visual art. The rich social options of this theme are intended to increase the visibility of your portfolio on Facebook, Twitter, and Instagram. This photography WordPress theme is an ultimate solution for building an online creative portfolio. Its default color scheme has a somewhat feminine look, but it can be easily changed in the admin panel. This theme offers many content block types: timelines, animated skill bars, education, etc. In other words, it is perfect when it comes to setting up an online CV. 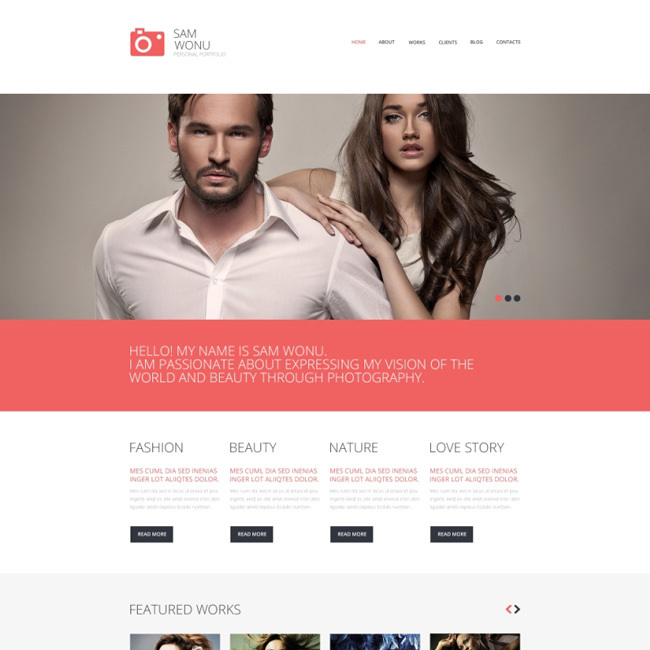 Sam Wonu is a multipurpose WordPress theme recommended for photo portfolios in the first place. Its lightweight design allows you to focus on visuals, so it’s a good choice for any creative website. This theme includes a built-in theme customizer, which lets you reshape the design completely by changing fonts, colors and block positions. 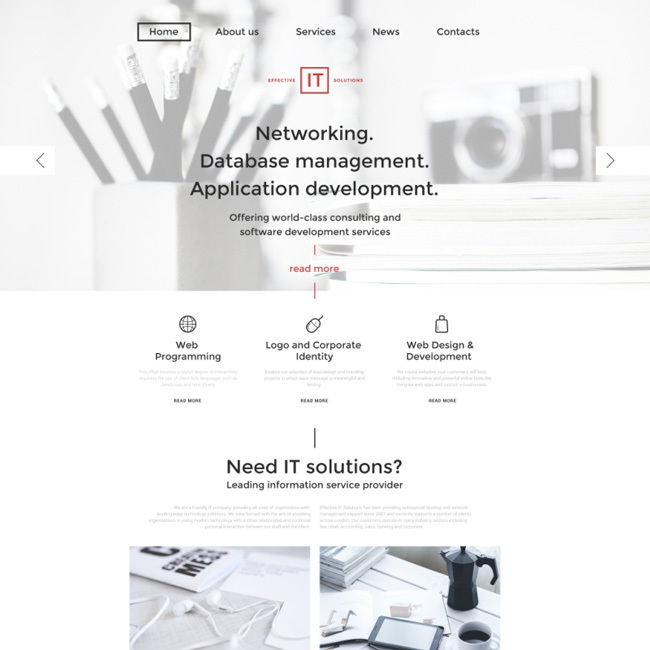 Effective IT Solutions is a responsive WordPress theme built with IT companies and marketing agencies in mind. It comes shipped with MotoPress Content Editor, MotoPress Slider, Google Fonts, Google Maps, and a set of source PSD files. This theme is retina-ready, so it will look great even on Apple devices with ultra high resolution. Aptly named, Creative is a minimalist WordPress theme for artists. It features a sticky mega menu, integrated social widgets, background videos, and powerful galleries. If you choose this theme, you should remember that it is strongly dependant on images. 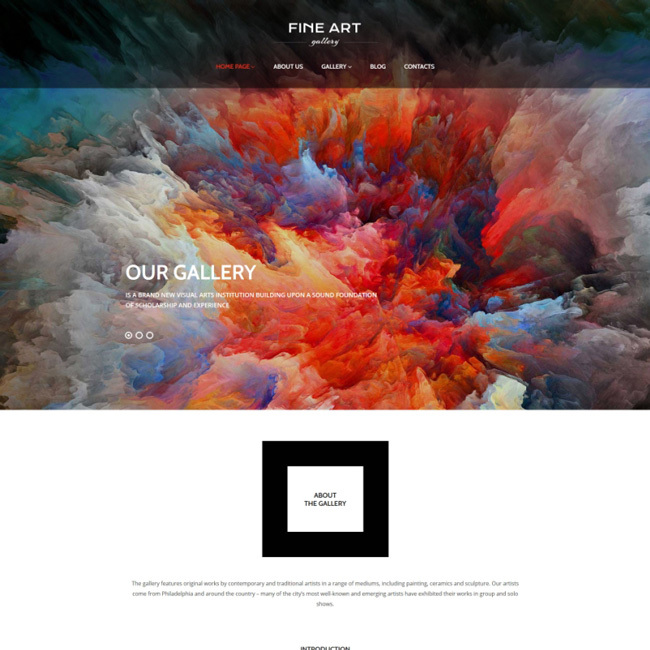 Fine Art Gallery is an ultra clean WordPress theme with design based on simple geometric shapes and creative fonts. To create a positive first impression a large image-based slider has been placed in the top of its homepage. It occupies the entire above-the-fold area, forming an improvised cover of your website. The menu is semi-transparent, so it changes its look as the slides shift. 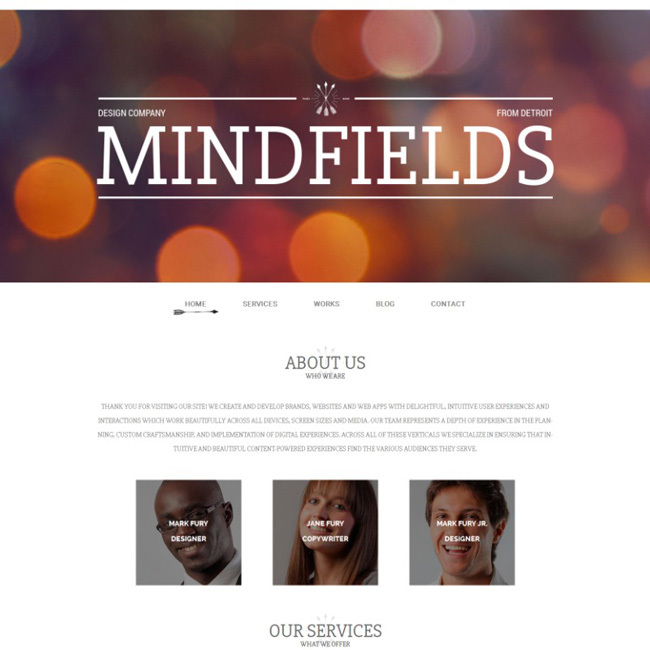 Mindfields is a simple design portfolio WordPress theme developed to power websites of web design agencies, photographers, and other creatives. As a part of the Monstroid child theme collection it comes with various tools, which will help you modify its look: Cherry Sidebars, Cherry Static Area Editor, Blog Layouts, and many more. By using them you will be able to create your own unique design on the basis of this theme. 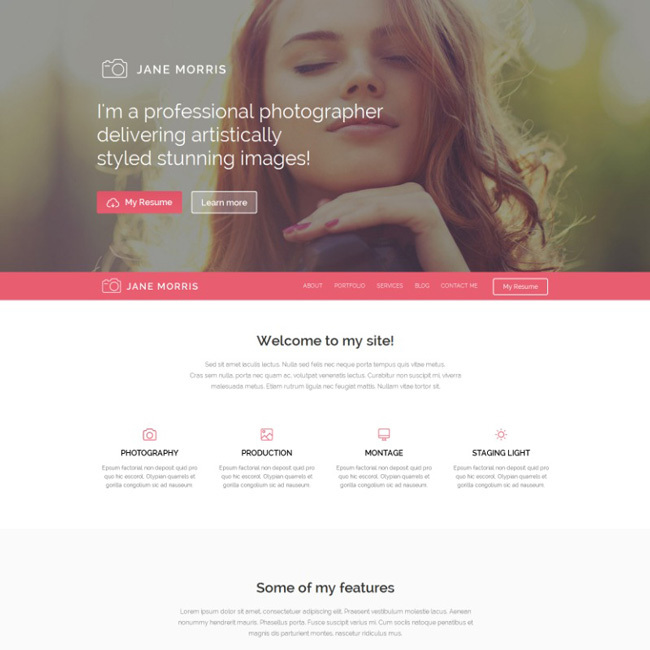 Jane Morris is a premium-looking free photo portfolio WordPress theme with sleek design and spectacular visual effects. It is based on Bootstrap and Cherry Framework, granting 100% compatibility with all modern browsers and devices. It also provides rich possibilities for email and social marketing. 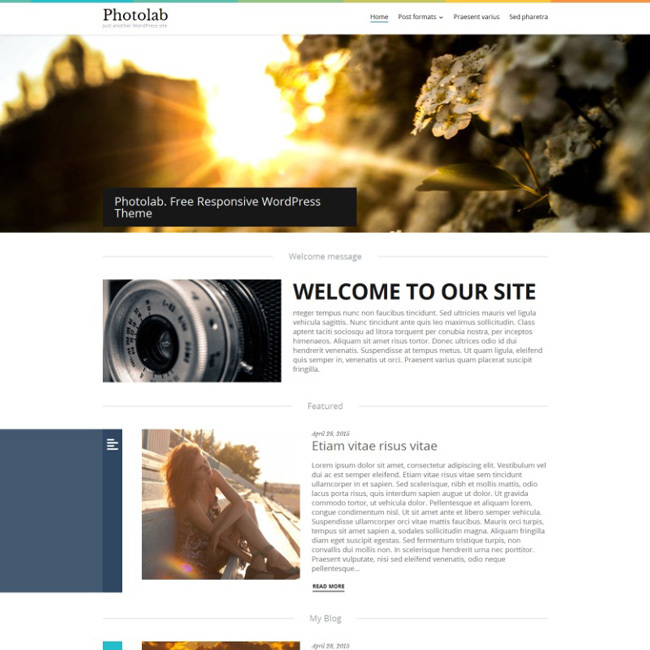 Photo Lab is a free WordPress theme for photographers, designers, and web developers. Its design is very minimalist, with colorful flat design elements. Just as its premium brethren it features several post formats, CSS hover effects, and rich gallery options. With the help of this theme launching your own photo portfolio is the matter of hours. 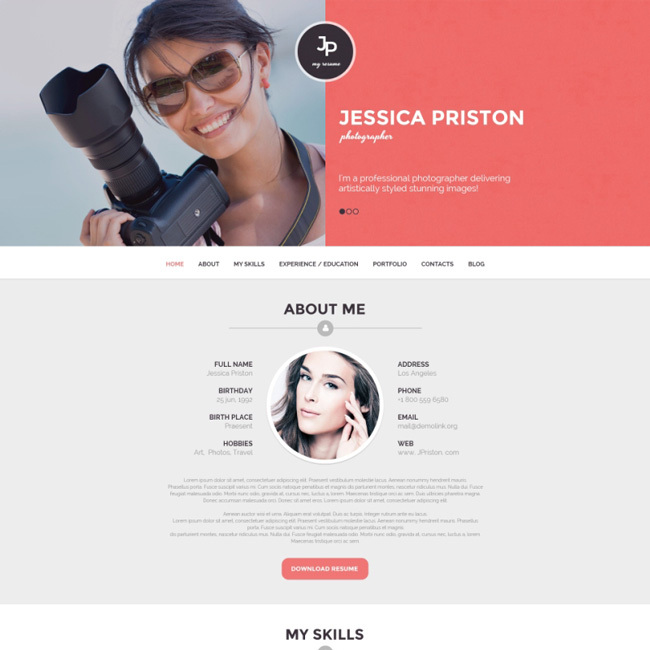 Melissa is a responsive photo portfolio WordPress theme with dark design. It stands out because of its unusual fonts, simple easy-to-navigate layout and lazy load effect. It supports audio and video integration, so you can enrich your website with media content. These were the 20 handpicked free and premium WordPress themes for creative folks. We hope you have found the one that suits you best. More similar themes you can find by following the link.